We have planned a special beer dinner for the evening of Thursday, January 22nd. We are featuring five amazing craft beers from Drekker Brewing Company (Fargo, ND) paired with a five course dinner designed and prepared by Judd Eskildsen from The Toasted Frog (Fargo, ND). Mark Bjornstad, Co-founder and President of Drekker Brewing will also be joining us for the evening. At our Winter Beer Dinner, you will be among the first to experience Drekker’s craft beers expertly paired with gourmet food. 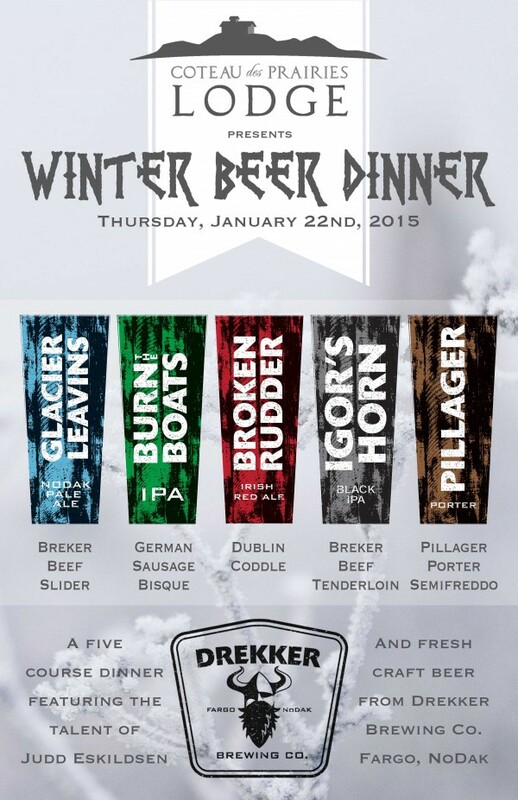 This will be Drekker’s very first beer dinner! Mark Bjornstad will introduce each of his beers and share stories from his experience of starting a brewery in Fargo, North Dakota and Chef Judd Eskildsen will describe the pairings as each course is served. In addition, we will be featuring our 28 Day Dry-Aged Breker Beef. Our unique 28 day dry-aging process was developed by Coteau des Prairies Lodge in collaboration with a local butcher who processes the beef. But we begin by selecting our beef from the very best animals raised and finished on the Joe Breker and Jeff Breker farms. Drekker Brewing Company is a brand new brewery located in downtown Fargo. Their taproom opened last fall and Mark and his partners have been doing all they can just to keep up with the demand for their terrific beers. When you raise a glass of fresh Drekker beer in their taproom, you are literally a few feet away from that beer’s birthplace in the fermenters of the brewery. From his Mom’s meatballs and gravy, to his Uncle Doug’s BBQ, the hearty, comfort food that Judd grew up on has always been very prevalent in his dishes. Although he has never had any formal training, the chefs and cooks he has worked with over the years have all played a part in him becoming a top tier cook in the area. The Drekker dinner is Judd’s first opportunity to independently create a multi course meal showcasing his own skill and interpretation of flavors. Currently, Judd is one of the few up and coming cooks working under Chef Steve Schulz at The Toasted Frog in downtown Fargo, ND. Fun Fact: Drekker’s Mark Bjornstad and Judd Eskildsen played football together at Moorhead HS and have been friends ever since. The event is on Thursday, January 22nd at Coteau des Prairies Lodge. Everyone is welcome, but space is limited and meals are available by reservation only. Alcohol will be served only to those over 21 years of age. The price is $60 per person. The meal includes a gourmet five course meal and 6 oz. of beer served with each course. Water and coffee will be provided. Sodas and additional alcoholic beverages will be sold at the bar. Doors open at 4pm, guests are welcome to come early, tour the lodge and enjoy refreshments served at the bar. When you arrive at the lodge, sign your party in with our hostess. Guests will be seated for the meal promptly at 6pm. What is the cost for dinner ? What a fantastic evening of great food, great beer and great conversation!! A really enjoyable evening! Can’t wait to hear what’s next!! Thank you! We agree the evening was a lot of fun! It was so nice to have you join us.